﻿What a great rhythm group! A dream comes true: Oscar Pettiford and Kenny Clarke – and then Billy Bauer on the guitar and alternately Ronnie Ball (UK) or Sal Mosca (USA) on the piano. No wonder that things really take off when these masters of improvisation from the Lennie Tristano school get going. 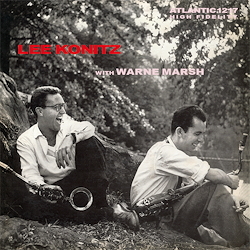 In June 1955, in the Atlantic studio, standards provided the starting base for the long and wonderfully sophisticated improvisations by Lee Konitz and Wayne Marsh, who were at that time pupils of the great Chicago maestro. Although the numbers are declared as own compositions, such as "Background Music" and "Ronnie’s Line", they are actually none other than adaptations of "All Of Me" or "That Old Feeling" – but at the very highest level. Lee Konitz always called this 'The Twelfth Step'. The repertoire is enriched by seldom-heard compositions by the great Oscar Pettiford. 'Time-keeping' – a neologism of prime importance for jazz musicians – is the most important element in "Donna Lee" and "There Will Never Be Another You" – and there is no better drummer for this music than Kenny 'Klook' Clarke, who lived in those days in the USA before moving to Paris in 1956 where there was no racial discrimination. Of course, you can buy these recordings on various digital discs. But that can’t be compared to a superb black disc and a cover with lines notes by the famous Barry Ulanov. Just one thing more: one of the musicians is still on the road. Lee Konitz is often to be heard and seen somewhere in Europe. Despite his almost 91 years!